Every year, the USPTO receives hundreds of thousands of patents. And they’re getting more every year. There were 490,000 USPTO patent applications in 2010, and just five years later, in 2015, there were nearly 630,000! That’s a never-ending torrent of new invention ideas — you might even have thought the world would have run out of ideas years ago! 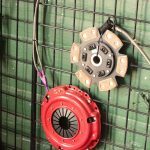 But if we’ve learned anything, it’s that inventions are a renewable resource. And sometimes you come across a truly weird and wonderful gem, an invention so bizarre and unexpected you can’t help but shake your head, while somehow also wishing you’d thought of it. Forget about the pea knife for a moment. Let’s take a look at that ad copy. I realize that advertisements tend to be boastful, but wow, the safety pea knife is punching above its weight here. Step aside, Henry Ford! 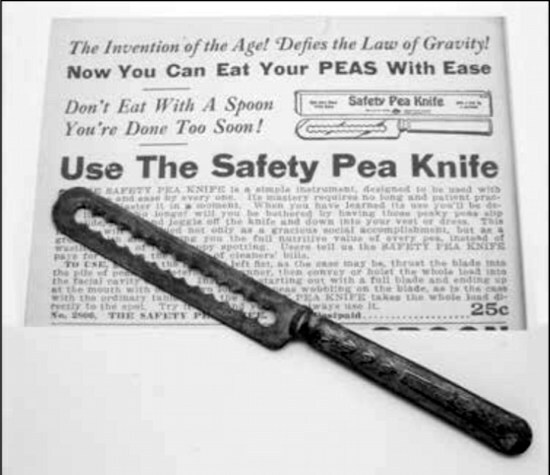 Invented roughly the same time as atomic energy, television, and transcontinental human flight, the safety pea knife haughtily proclaims itself to be the invention of the age (that conquered gravity). No longer will anyone cut themselves when eating peas with a knife. And of course you eat peas with a knife, because spoons aren’t slow enough. We can all agree that the pea knife is ridiculous. 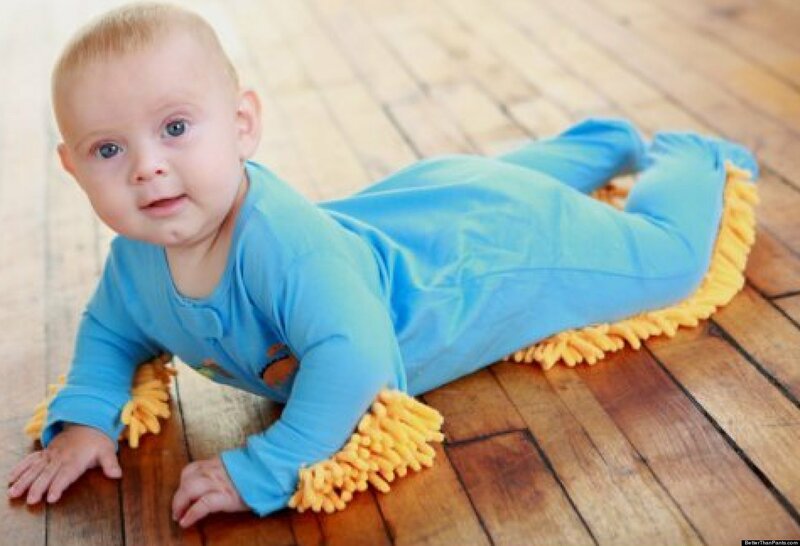 But the baby mop is just a fantastic invention idea. They’re gonna be sliding across the floor, anyways! And parents will have their hands full just taking care of the little creature. You may as well have them clean the floor before they develop any kind of self-respect. That’s right! For the first time since the invention of the remote control, they’ve come up with an “improvement” on the basic concept of the remote control! 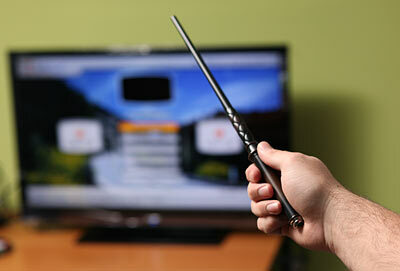 Who needs buttons when you can imitate miniature wizards while simultaneously compelling the obedience of your muggle technology? 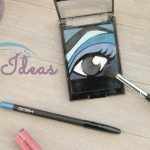 While this invention idea is certainly weird, it is still something that people are likely to actually want. Probably a good number of people. On the other hand, there’s probably a group of roughly equal size that will never speak with you again. 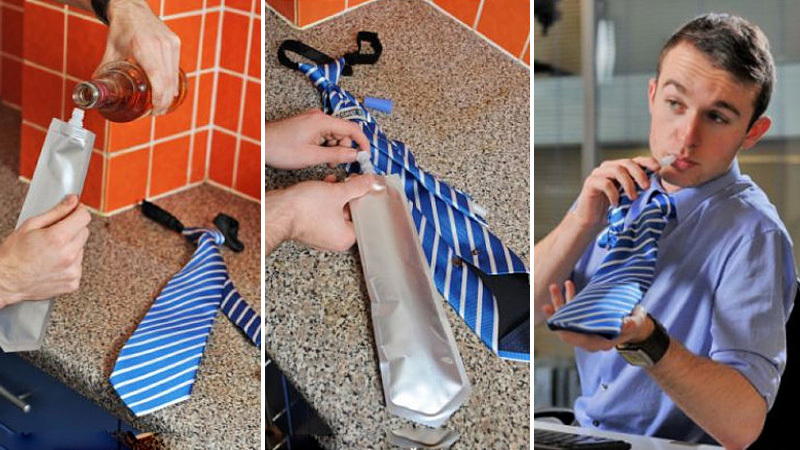 Speaking of things that will cause people never to speak with you again, how’s about a tie that you fill up with booze? If you’re the kind of person who thinks that secretly is the best way to drink, you’ll be kicking yourself for not having come up with this invention idea. For some reason, the company that sold the original flask tie seems to be no more. I wonder if it was the work ethic? Ostriches don’t actually hide their heads in the sand, and neither did the intrepid inventors of the Ostrich Pillow! Have you ever wanted to have a nap in a place that is completely inappropriate for naps? Ostrich pillow! Is your desk at work too hard and edgy? Ostrich pillow! Hung over from all the booze in your tie? 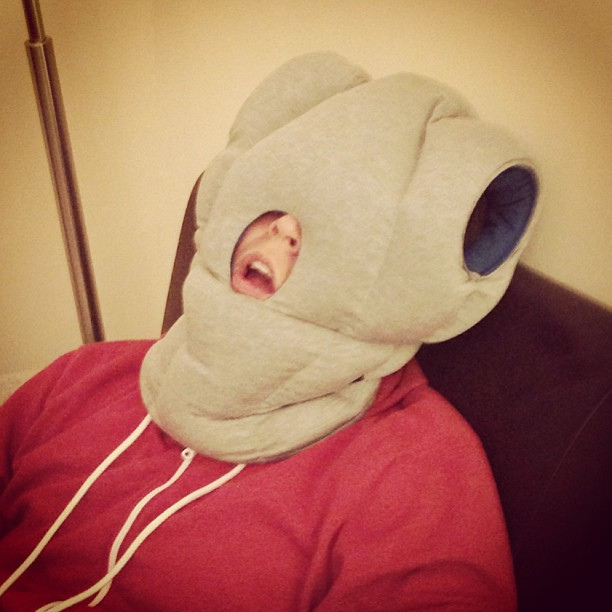 Ostrich pillow! It’s even got arm holes. Most of these weird inventions (wonderful though they are) range somewhere on the scale between mostly and completely useless. 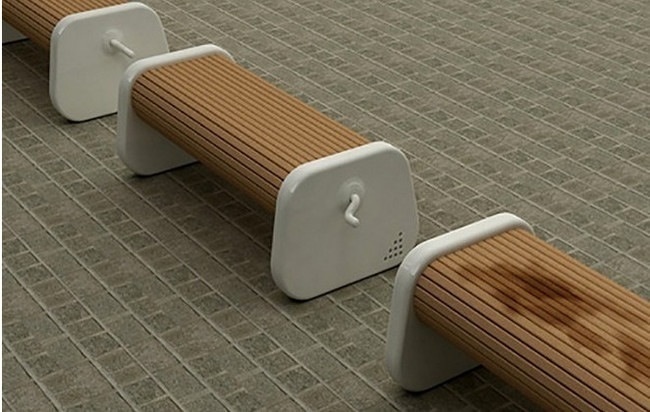 Not the case for these revolving park benches! Most public benches seem to have been designed by the Marquis de Sade, the only real innovation in benches seeming to be the attitude that they ought not be comfortable for humans. This is different, though! Did it just rain? Did someone splatter ketchup all over the bench? Well crank the lever and rotate the slats until a fresh segment emerges. Inventions have to serve some kind of useful function, to meet a certain need. 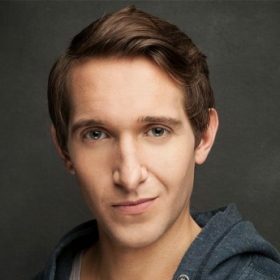 This invention meets the need to capture the expression on the face of the guy you just murdered. It takes a shot when you take a shot. 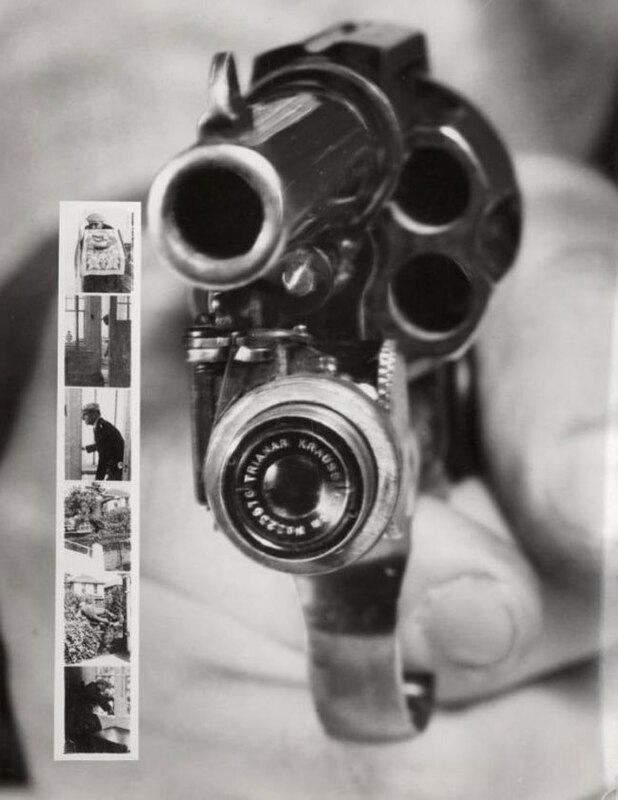 It shoots both bullets and film, is what I’m saying. I can’t imagine why this invention never took off. I hate to be the one to break this, since I’m sure someone reading this has one of these things. But selfie sticks are an abomination. You might think that you end up looking better in the selfie you put up online, but in the real world, during the time you spend posing for yourself in public, you look like a dork. And you get in everyone else’s way! Future historians will talk about the degeneracy of the Internet age, and will hold up selfie sticks as examples. But they won’t hold it up to take a staged photo of themselves, because in the future they will be more civilized. So it’s a vending machine for tanning, seemingly installed at an incredibly fake pool. With technology so advanced, you can apply a realistic spray-on tan even without taking off your watch. 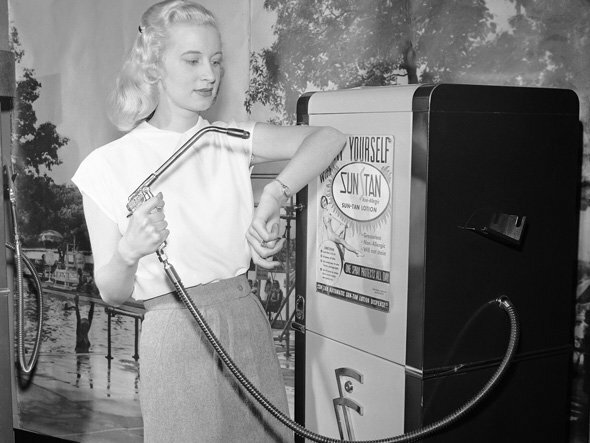 Hey, it’s probably better for you than a modern tanning bed, though. 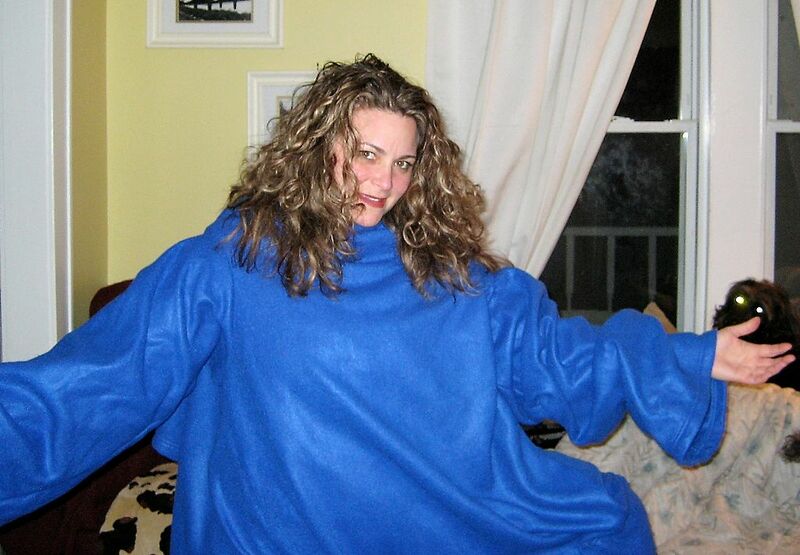 Perhaps better known by the trademark Snuggies, we’re all kicking ourselves for not having come up wth this one. Fleece blankets are cool. Bathrobes are pretty solid. Nothing to write home about. 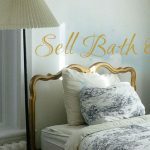 But make a bathrobe out of fleece, wear it backward, and suddenly you’ve got a wild hit product on your hands. Sometimes there’s no predicting these kinds of things. Love inventions (and inventors!)? 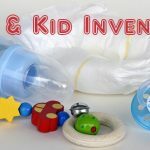 Learn more about exciting, weird, and cool inventions in the Invention Ideas forums! And be sure to check out our Inventor Groups to find local events in your area.